It is impossible for me to contain the joy bubbling up from my soul these last few days prior to a St Croix visit. The anticipation has me nerved out in a good way. Soon I will be back in very familiar territory underwater. I love peering into a big sponge to see what is inside. The villa we are renting is one of as kind, directly on the beach. On St Croix, one is more likely to rent a villa on a hillside overlooking water, rather than being directly on the beach. Gigi and I stayed at this 3 bedroom villa a few years back. I would wake up in the morning and walk directly in the wave less ocean and go swimming. 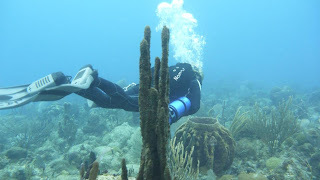 St Croix has few waves because of the barrier reefs, and almost no tide because if its location towards the equator. It is like having a heated saltwater swimming pool outside your door. The whole back of the villa is a covered veranda that has a dining table, grill, and chase lounges. And then there is the Scuba……. You just like to say 'veranda'. Haven't you left yet? Hurry! Your little piece of heaven on earth!